Faced with fewer resources and calls for complete State Bar reform, the State Bar Court reorganized its staff to save nearly $1 million a year. Court officials said that rather than simply scaling back operations, the reorganization allows the court to "continue to timely and efficiently process all of its cases" while permanently reducing the staff from 52 to 37 positions. "This shows that with some determination and creativity, and a willingness to give up some time-honored notions that may no longer hold true, we can deliver a fine product with less money," said former executive director Steven A. Nissen. He praised presiding Judge James Obrien and chief court counsel Scott Drexel for overseeing the 30 percent reduction, which will save $920,000 annually. The streamlining represents the kind of tighter efficiency Nissen sought to achieve with plans to restructure the entire State Bar. Michael Cohen was a New York City transit worker. Lena Cymbrowitz, James P. Hayes and Howard Mills were professional fundraisers. Tom Duane was a stockbroker. Daniel Hevesi was a financial analyst. And all six are freshman members of the New York state legislature. Throw a res ipso loquitur at them and you're likely to get blank stares. Not a lawyer in the bunch. But all six were elected to seats that had been held by lawyers. 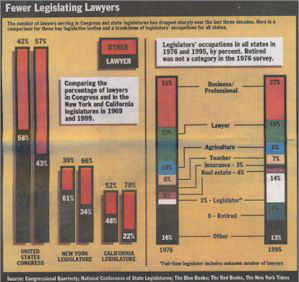 State legislatures have always had their farmers, teachers, engineers and entrepreneurs, but from the early days of the republic, no group has been as over-represented as lawyers. But for the past three decades, even as the profession has grown in numbers, its grip on state capitols has steadily slipped, a trend that continued in the turnover brought by the November elections. Jeffrey T. Gersick, the secretary and number two man at the State Bar for the past seven years, was named acting executive director last month after Steven A. Nissen resigned to take a job in the governor's office. The well-liked Gersick was appointed unanimously by the board of governors to serve to the end of the year or until a permanent executive director is hired. Although the vast majority of Americans believe the U.S. justice system is the "best in the world," nearly half believe that same system treats minorities unfairly, according to a recently released survey conducted by the American Bar Association. The survey also found uneven knowledge about the workings of the justice system, strong confidence in judges and limited confidence in lawyers. In addition, the public believes court costs are too high, court matters take too long to resolve and convicted criminals have too many opportunities to appeal.